Truck Driver Crazy Road is a truck driving simulation where you must drive through bumpy and hazardous terrain carrying a bunch of cargo. Just like in real life, in this game, you must not damage or lose any of your cargo. If even one of your cargo went missing or fall of the truck, you must start the level all over again. The game features beautiful 3D graphics and nice physics engine. The game has multiple levels and various trucks to drive! Don’t be impatient and drive carefully! Drive your big truck and take it to the mountains! Test your driving skills, patience, and determination in Truck Driver Crazy Road! Try to get your destination with 100% of the cargo intact! 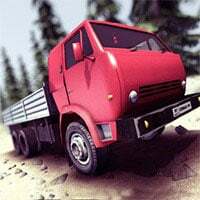 Truck Driver Crazy Road is a free online driving game on Round Games.